Each knife set contains a varying range of different knives. 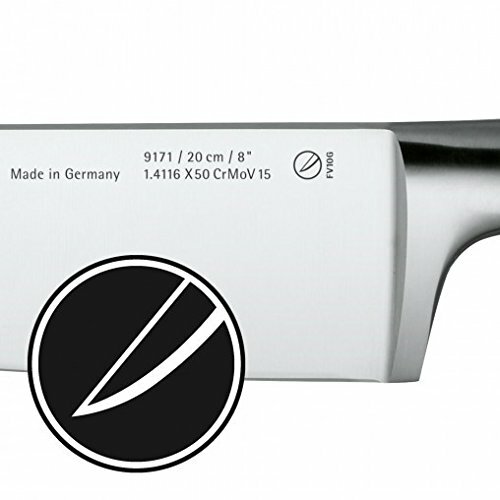 For example, the five-piece sets in the Grand Class, Grand Gourmet and Spitzenklasse Plus collections cover the whole range of essential kitchen knives - a vegetable knife, a chef's knife, an all-purpose knife, a meat knife and a bread knife - leaving you optimally equipped. 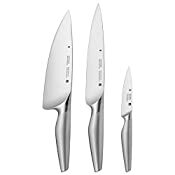 Three-piece sets are also available - mostly consisting of a chef's knife, a preparing knife and a vegetable knife - for less-demanding requirements. Those who like a splash of colour will be delighted with the bright and colourful sets in the Touch series. As you can see, there are plenty to choose from. Which set is best for you? As the name suggests, the Chef's Edition was designed for professional chefs and for all those looking for maximum cutting precision. The idea behind the collection came about after a workshop on handling and cutting techniques. Professional chefs hold wide knives between their thumb and index finger just in front of the bolster - i.e. precisely where you would find a sharp edge on standard knives. This realisation led to the development of a knife with a smooth transition between the blade and the bolster as well as on the spine. As there are no sharp edges, the knives in the Chef's Edition fit perfectly in the hand and effortlessly cut through even the thickest pieces of meat and the crunchiest of vegetables. Thanks to the seamless transition between the blades and the stainless steel handles, the models are particularly easy-care and hygienic. The series includes a larding knife, an all-purpose knife, a chef's knife, a carving knife and a bread knife as well as a Chinese chef's knife. All blades are Performance Cut, guaranteeing outstanding, long-lasting sharpness. Besides tactile and functional qualities, the Chef's Edition also boasts a modern design. Handle without grooves made of high-quality rust-free Cromargan® stainless steel.